If you’re not caught up on our last two posts about this trip, click here for Part 1 and here for Part 2. The only way to describe this leg of the journey was hot. And this is where the air conditioning in the car was a life-saver. 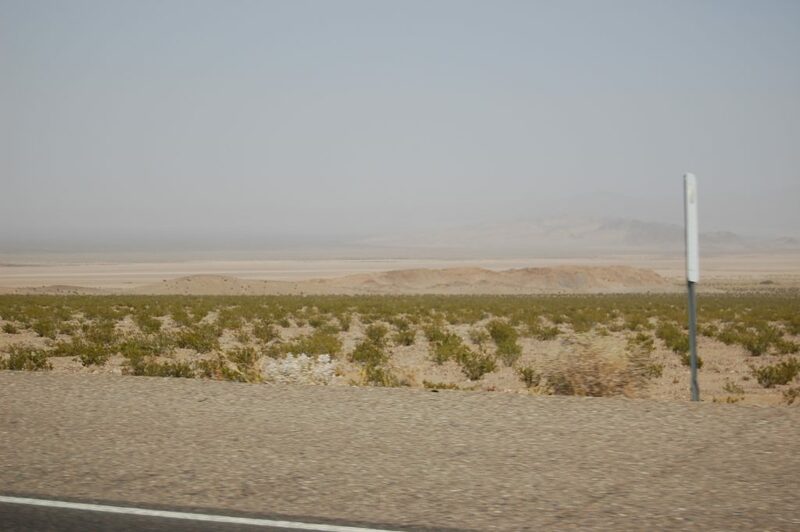 It was the beginning of July and we were driving to Las Vegas – the middle of a desert. The Mojave Desert. Our views didn’t change much. The roads leaving San Francisco and heading towards Vegas were quite difficult to drive on. Speed limits were posted often enough, but people who were in the slow lane were driving slower than the posted limit, and people in the fast lane were driving much quicker than the posted limit. This made it difficult because we wanted to pass the slow people, but often struggled to switch lanes into the fast lane to do so. It caused some frustrations and some name-calling being mumbled under our breaths, but in the end we made it through. 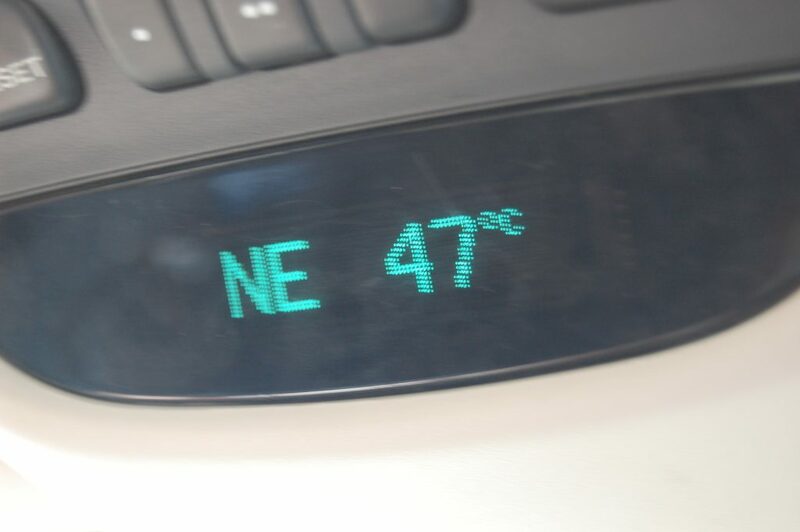 While driving through the Mojave Desert, English James (who doesn’t experience extreme temperatures at home and often decides to test their limits) decided it was a great idea to open the car window just to see what the 47°C that the in-car thermometer was displaying actually felt like. The answer to that was: horrible. It was so dry and so instantly hot that he immediately regretted his decision. The window quickly flew back up and the life-saving A/C was turned on full blast to regain the coolness that we needed. There weren’t any other cars around in the desert. The only things that were dotted around us, except for cacti, were the remains of blown tires. That’s how hot it was. This scared us a little, so we stepped on the gas a little more than we usually would just so we didn’t end up stranded in the middle of the desert with a blown tire. Being stranded in Portland seemed like luxury compared to what could have happened here. Luckily we had no incidents and continued through to Vegas where we met up with our friends. We spent three lovely nights here which, with extremely good planning, fell over July 4th celebrations. We gambled, we watched baseball, we watched fireworks, and we stayed in an awesome timeshare condo just off the strip that had a TV in every single room. Literally, every single room. The bathroom even had a phone. What?! Vegas is quite the place to visit, and we would highly recommend it to everyone. As long as you’re over the age of 21, at least. We saw a lot of families there and we’re just not sure why you would take a family trip to Vegas, out of all places. I’m sure you can have a lovely time, but why take minors to a place full of liquor, strip clubs and gambling? 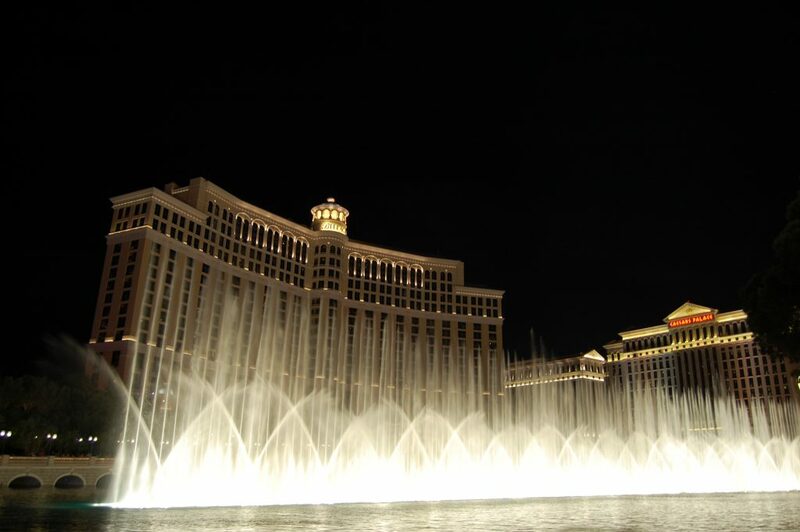 Yes, Vegas offers more than that, of course, but it still seems like a funny option to us. But we do know that people will disagree. Now this is another unexpected moment in our three-week journey. I guess you have to expect a few unexpected things to creep up. Were we planning on spending our night in Williams, Arizona? No, we had never even heard of it before. I can’t even tell you where we were supposed to be sleeping, but I can tell you that we had a hotel room booked. A nice, comfortable, warm hotel room. We left Vegas with the intent of reaching the Grand Canyon. The drive wasn’t too far so we thought time wouldn’t be an issue. We said goodbye to our friends, who were flying back to Edmonton, after enjoying one last morning with them and then hit the road. 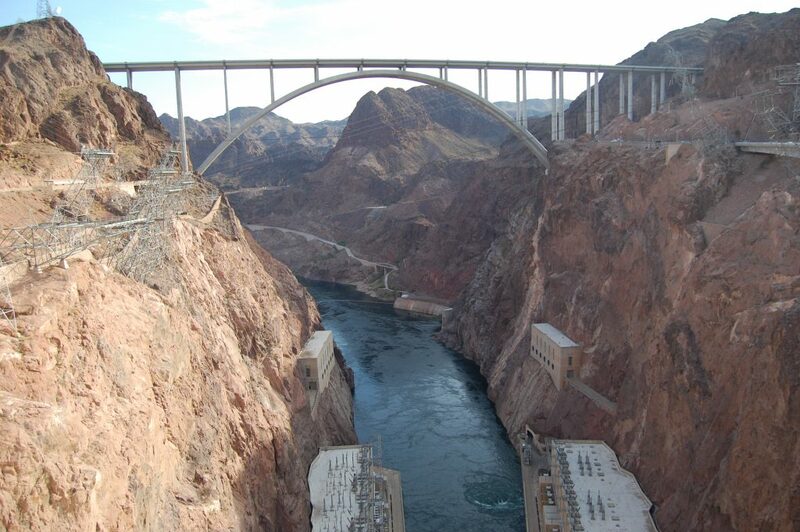 Our first stop was to the Hoover Dam, which sits on the Nevada and Arizona border. If you’re in the area, it’s well worth a visit. This was my second trip here and found it just as jaw-dropping as the first time. A bridge over the top of the canyon has been built over the years (I saw it during two different stages of construction over my visits) so that just means I have to visit again once it’s complete for the fantastic view of the area. Construction nearing the end. It’s been finished for a few years now, but we haven’t been back to see it! 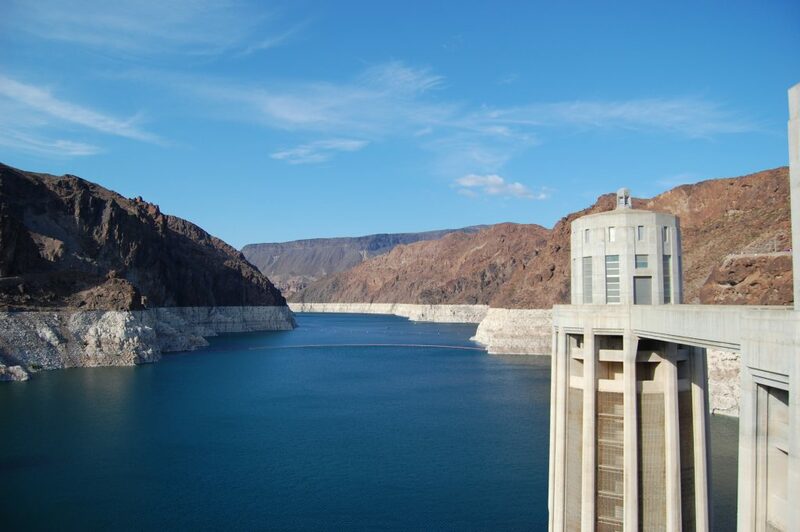 The Hoover Dam has a lot of history. Blood, sweat, tears and many lives went into the construction of this dam, which ended up providing the nearby region with safety from floods, water for irrigation and hydroelectric power. The dam itself is an extremely impressive feat and definitely worth stopping to see. If you’re afraid of heights, looking over the edge will give you butterflies but don’t let that stop you! The white rock used to be underwater. The straight line running through shows exactly where the waterline used to be. After some exploration we hopped back into the car and aimed east, before we were going to turn north and head to the Grand Canyon. The day quickly turned into night; the sun had disappeared much quicker than we anticipated and we were drained from our trip so far, especially with our last stop being Vegas. We felt that we couldn’t drive any further and stay safe, so we pulled over into a hotel parking lot and had no idea where we were. Turns out it was Williams, Arizona. We went inside and inquired about getting a room for the night, and also rang our original hotel and explained the circumstances. Unfortunately they weren’t able to give us a refund. The hotel we were standing in had rooms available but not within our budget, especially with having to pay for another room that night already, so we headed back to the car. What were our options? The best thing we could think of was sleeping in the car in the parking lot of the hotel. Was it a good idea? It seemed like it as we hung out and passed the hours away by playing cards (this was 2011. None of us had a smartphone yet to entertain ourselves or to look for other options). That was until the police showed up. Not one police car, but two. We could tell we were in a small town when two cars showed up to investigate a car with three people in it in a hotel parking lot. Turns out some guests of the hotel thought we looked suspicious (all those Go Fish hands clearly threw them off) and called the police, who asked us what we were doing there. We explained our predicament and they asked what our solution was. We didn’t think they would like the idea of us actually sleeping in the parking lot, so we said we were trying to figure out what to do and were just wasting time at the minute. They pretty much told us to move on and find somewhere else. Off we go, back onto the road with absolutely no plan whatsoever. And, again, no smartphone to save the day. As we drove, we could see the police cars following us. Clearly they wanted to make sure that we weren’t actually up to any trouble, and probably also that we didn’t just park up anywhere else randomly. That’s when we saw a sign for a campsite. We really didn’t want to spend any money staying anywhere (again, we already were paying for a hotel room that was miles and miles away), but with the police hot on our tails we thought it was our best move. We turned up when everyone was already tucked into their sleeping bags and fast asleep, clearly having a much more relaxing night than we were. We managed to track someone down (a friend of the owner) who said we were more than welcome to stay for $15 and to see the owner in the morning for payment. We parked the car in our campsite, cranked the chairs back as far as they could go, and settled in for the night. And it was a horrible night. Our backs were sore and we woke up constantly throughout the night shivering and in a cold sweat. It was the most uncomfortable, restless and freezing cold sleep that we’ve ever had. The next morning we woke up (did we even really sleep?) and drove up to the office so we could pay what we needed to and hopefully actually make it to the Grand Canyon at some point during that day. We met the campground owner who promptly asked us for $40 for our nights stay. Excuse me? $40? We got there at about midnight, didn’t pitch a tent, didn’t take a shower, woke up and used the toilet once each, and were ready to leave by about 9am after having a horrible sleep. What about that was worth $40, especially when her friend told us we would be allowed to pay $15? After a small debate, she grudgingly settled on $15 after we threw all of our very valid points out into the open. We think the kicker was when James stated that we could have easily driven off in the morning and she wouldn’t have even known we were there. Not that we would have done that, of course. We don’t have a separate blog post on things to do and see in Williams, Arizona because everything you just read was literally everything that we did here. We couldn’t even recommend a restaurant because we didn’t even have a meal here! We did take away a lot of memories though. Our one night in Williams, Arizona will be talked about for years to come. Unfortunately we were too busy to take any photos. And, finally, we set off to the Grand Canyon! Have you ever had a confrontation with the cops on your travels? What was the most uncomfortable sleep of your life? Let us know!